Friendly Fundamentals - Codeer Ltd.
Frienldy is a magical library! It breaks through the walls of process! Please also see the API Reference. This is a perfect ordinary Windows Application that is manipulation target. The target and test processes must use the same processor architectue. 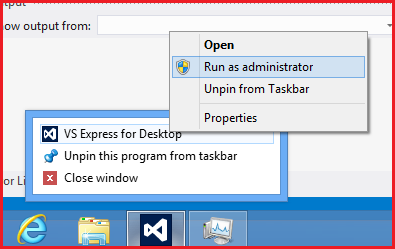 If you are using VSTest, you can set this by using the Visual Studio menus as shown below. If the target process is running as an administrator, the test process must run as an administrator, too. Variables are referenced from the target process. You can access public and private members. You can use serializable objects and reference them in the target process. If you use serializable objects, they will be serialized and a copy will be sent to the target process. // get SampleForm reference from the target process. // new instance in target process. // referenced object exists in target process' memory. // when you perform a cast, it will be marshaled from the target process. // No good. Result is false. // No good. Result is null. // No good. Throws an exception. AppVar is part of the old style interface. You will need to use AppVar if you use the old interface or if you can't use the .NET framework 4.0. The old style sample code is pending translation, but the code is in C#. Please have a look here if you are interested. Friendly operations are executed synchronously. But you can use the Async class to execute them asynchronously. // Async can be specified anywhere among the arguments. // You can check whether it has completed. // You can wait for it to complete. // For , use alias according to .NET framework rules. // Text will obtain its value when the operation completes. // When the operation finishes, the value will be available. //The code let tasrget process load current assembly. //You can use class defined in current assembly. They are built on top of Friendly. They wrap GUI manipulation by Friendly.